Mark Shane is one of the finest jazz pianists alive. Don’t take my word for it — ask the musicians who have played alongside him, whose music he has enlivened and uplifted. Or ask any other jazz pianist who knows how to swing. He can swing in a way that is deeply reminiscent of Fats, Teddy, James P. — but he is no archaeologist, no copyist perfecting what he’s memorized from the manuscript. (He’s no museum piece, either — having learned a great deal from Hank Jones and Tommy Flanagan, too.) A long apprenticeship as an improvising player — with Bob Wilber and Ruby Braff, among others — made him a fully mature player. In his work, you’ll hear great subtleties — his harmonies, his intertwining lines — but he never shows off his technique. Rather, he is both eloquent and plain, serving the song and its emotions. Shane is instantly recognizable (his four-bar introductions are lovely compositions on their own) and he is his own man. His music is delicate — because of his beautifully executed ideas and his touch (there’s classical training in his background and it shows) but he is a powerful player and his rhythm engine is always well-tuned, his swinging time impeccable. What is the reason for all this praise? 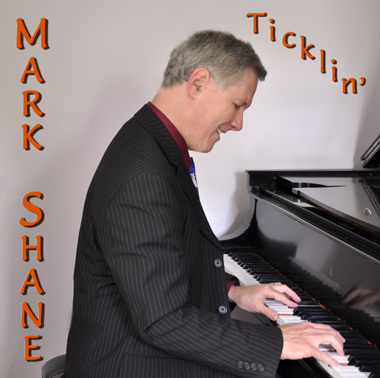 Shane has issued another self-produced solo CD — TICKLIN’ — its title in honor of the great Harlem piano virtuosi, the “ticklers” of the last century. It took me a long time to listen to it all the way through because I kept playing tracks over and over, returning to a certain passage to marvel at its own kind of luminescence, its joyous forward motion. Under his fingers, Newton’s laws seem to be modified in the happiest of ways — you find yourself delighting in his intensity, his moving things forward in a delightful fashion, while at the same time there is the utmost relaxation, the absence of hurry, of rush. Mark doesn’t like what he calls “draggy ballads,” so most of the CD takes place at a variety of nimble medium tempos . . . music to pat your foot by, but also lovely music to meditate by. And to practical matters: the piano sounds lovely; the repertoire is varied, offering both the familiar — BODY AND SOUL — and the less so — CRYIN’ FOR THE CAROLINES and James P.’s FASCINATION. No tricks, nothing fancy, just one glorious improvisation after another. Shane’s music is a wonderful cure for whatever darkness may pass through your days. I’m always delighted to learn about someone younger who has the real jazz spirit. Many people can play. But not so many can really play — and there is a difference beyond the changed font. To get past one’s technique to be creative (without being self-indulgent); to honor the jazz tradition without being stuck in the past; to get a lovely sound out of one’s instrument; to create solos that stand on their own as artistically complete; to tell one’s story . . . that’s more rare. You’ll admire his light touch, his lovely voicings, the way he makes the piano sing out. And he’s got an innate rhythmic enthusiasm that makes for danceable music — without sacrificing everything for the pure push of rhythm. Alex says he’s been inspired by the late Herman Foster, but he doesn’t sound like one of those technically-assured people with no ideas of their own. You know, all those Jazz-Master-Clones, well-intentioned but ultimately limited. The musical pleasures I am describing are to be found on his new CD, called NEW YORK PORTRAITS (its neat cover, designed by Peter Moser, is at the top). Without making jokes, Alex is witty — catch the extended intentional detour into JEEPERS CREEPERS on CHEEK TO CHEEK, fitting perfectly. He’s courageous, too: it takes a certain candor and openness to approach BODY AND SOUL these days, and his version stands beautifully on its own. Alex has surrounded himself with the best talent: bassist Michael Bates and drummer Brian Floody, and left them space to breathe, to sing their own songs. The two originals on this CD have their own melodic gravity — and shape, and the music Alex has created will (although accessible to people who “don’t like jazz”) will reverberate pleasantly in your ears for a long time. Check him out. As Billie Holiday said of Jimmy Rowles — she was telling Lester Young about this new White musician, unknown to Lester (who was suspicious), “I don’t know . . . boy can blow!” As can Alex. SWING OUT WITH JUST ONE CLICK: ALL MONEY COLLECTED GOES TO THE MUSICIANS! The music I heard and captured at Michael Kanan’s piano soiree at Sofia’s Ristorante (in the Hotel Edison, 211 West 46th Street, New York City) on Dec. 4, 2010, so captivated me that I decided to post another half-dozen performances from that splendid night. The participants were Larry Ham, Pete Malinverni, Tardo Hammer, and Michael, piano; Neal Miner, bass; Eliot Zigmund, drums. What continues to fascinate me is the wide emotional range in these performances — from spiky to tender, from witty to rhapsodic. Although these players know the traditions deeply and empathically, this wasn’t a repertory evening, with the ghosts of (say) Nat Cole, Bud Powell, Fats Waller, McCoy Tyner . . . etc., being feted. It was enthralling to hear these men at the piano and the warm-hearted playing of Neal and Eliot — a gathering of friends. When I met Michael about a week later (he was playing alongside Dan Block at the Brooklyn Lyceum) I complimented him on his format for the evening, where each of the four pianists played two leisurely selections, then got off the bench for the next player. I thought it went a long way in preventing the usual set-shaping that musicians fall into, but Michael pointed out one of his aims (fully realized) that I hadn’t consciously absorbed. I had seen the other players paying close attention while they were members of the listening audience — but Michael had more than this in mind: that each player would be influenced (subliminally or directly) by what his colleagues had played — making the evening an organic artistic whole rather than simply a round-robin. It worked — and it transcended my already high expectations. Here are a half-dozen more opportunities to savor this evening. This was a wholly gratifying jazz evening: I hope Michael can arrange piano soirees on a regular basis! Adolph Daidone – professionally known as Al Duffy – died on Dec. 22. The violinist was 100 years old and had been a member of 802 since 1924. He was born in Brooklyn and was a resident of Freehold, New Jersey, since 1978. Mr. Daidone was a nationally renowned violin virtuoso whose career spanned several decades of entertainment in radio, recording, and stage. He was awarded the Philco Radio Hall of Fame Citation for outstanding artistry. He played for the Paul Whiteman Orchestra, Bell Telephone Orchestra with such luminaries as the Dorsey Brothers, Bobby Hackett, Dinah Shore, JimmyDurante, and many others. He is survived by four children: Vincent and his wife Barbara, Theresa Kimmel and her husband Monroe, John and his wife Elna, and Louis and his wife Teri; eight grandchildren; and eleven great grandchildren. Anthony Barnett adds: According to my files he was born Gandolfo Daidone 20 September 1906 which would make him older than 100. The moral has to be that jazz taps in to the Fountain of Youth for a few lucky people! Also that originality is a saving grace: Duffy was an accomplished player who took his own route rather than attempting to imitate Joe Venuti. Intriguing that jazz listeners should have to rationalize, even apologize for what some perceive as a weakness. Must we continue to champion “originality” and “innovation” as prime virtues? Frankly, having someone “spearhead a period of radical change” sounds dangerous, unfriendly. I have to wonder what the jazz chroniclers thought was so wrong with any period of jazz that “radical change” was needed to rescue it from its artistic limitations. One hears Roy Eldridge or Johnny Hodges in 1944. Had their styles so calcified as to need all this spearheading? I think not. But the historians present it as if they were detritus waiting idly to be swept aside by the radical whiskbrooms of The New Thing. This, I suspect, comes from our advertising-driven desire for the New, our impatience with anything that looks Old. Milk spoils; art doesn’t. And to the championing of “originality”: let us propose that the “originals” of jazz were (I will pick five): Louis, Duke, Bird, Monk, Coltrane. None of them, for a moment, pretended that they had come from nowhere, that they had created themselves. Behind them stood Joe Oliver, James P. Johnson, Will Marion Cook, Lester Young, Benny Goodman, Benny Carter, Teddy Wilson, Johnny Hodges, Coleman Hawkins . . . and so on. The musicians know that they are all branches on a growing tree; the historians who wish to set one School against another, to make good press, to sell CDs, create artificial distinctions. The performance has an easy, tango-inflected swing, helped immeasurably by Hal Smith on drums — a master chef behind his set, mixing and flavoring with his wire brushes, swinging without getting louder or faster. I thought of Walter Johnson, among others: watch the way Hal moves! Cornetist Schultz has a fine Spanier-Marsala passion, matched by trombonist Doug Finke, whom I associate with rousing Stomp Off CDs by his Independence Hall Jazz Band. I recently reviewed a Fifties jazz-goes-medieval effort where the participants earnestly jammed on recorders: they should have studied Jim Rothermel, sweetly wailing away. Thanks to Scott Anthony on banjo, who delivers the song stylishly, Chuck Stewart on tuba, and another one of my heroes, pianist Ray Skjelbred, for keeping the ship rocking but afloat. Our travel plans for the summer have us heading north, not south — so I’ll content myself with this YouTube clip, spicy and sweet. In the last few days I’ve been listening to the Benny Goodman Festival being broadcast on WKCR-FM (if you’re out of range of this New York City FM station, you can hear it online at www.wkcr.org). Whenever I turn on the radio a Goodman small group is eagerly exploring AVALON at a jaunty tempo, a coincidence that both amuses and puzzles me. Now, I don’t plan to accuse Goodman of being an aging artist caught in his own boredom, but the frequency with which jazz musicians return to their own narrowing repertoire of familiar songs to improvise on is worth comment. I know that Hot Lips Page famously said (to whom?) “The material is immaterial,” and Bob Rusch has gently reminded me that jazz is about what one does with the material rather than the material itself. “‘T’ain’t what you do, it’s the way that’cha do it,” sang Trummy Young. And anyone brave enough to improvise in public at the tempos Goodman favored should, by law, have the right to choose his or her own favorite set of chord changes — no matter whether the improviser in question is Charlie Parker, Louis Armstrong, Mary Lou Williams, or John Coltrane. But I’ve also heard some of the finest jazz artists turn in established solos on familiar pieces for their features, occasionally playing something quite moving, but more often falling back on set routine. I think of Jo Jones’s CARAVAN, of Buddy Tate’s BODY AND SOUL, of Vic Dickenson’s IN A SENTIMENTAL MOOD, and so on. One could, of course, make the case that jazzmen have “master solos” and “polished performances” to fall back on, because improvisation is such a demanding art. And Ricky Riccardi has made the point that Louis Armstrong’s versions of INDIANA that often began his later performances were anything but rote repetition. But Benny himself (according to Ross Firestone’s sweet-natured biography) seems to have been dissatisfied with the music he played in his last decade, saying to someone, “You can’t play LADY BE GOOD forever.” But he did play AVALON for fifty years. Did he play it so regularly because it was a song he loved from his childhood (it first appeared in 1920)? Did he return to it because it was one of his proven hits, a selection that his audience — sometimes made up of people who had cheered him on in 1937 — wanted, expected, and waited for? Did he feel a responsibility to please the people who had paid to hear him with a medley of his Greatest Hits? Or was playing AVALON something that gave him pleasure in itself — both as a stunning ride over the chord changes and as a way of making an exciting performance? I can’t begin to say. And some of the performances of AVALON I’ve heard on WKCR-FM are justly thrilling — not just in terms of technique and facility, but as musical expressions — evidence of an older artist still finding “something new to say” on a familiar text. Some of them sound like Goodman playing at being Benny Goodman — with playing that is technically exciting but not especially creative improvised music. The only time I was fortunate enough to see Goodman in person — at a great distance — was at a Carnegie Hall concert in 1974 or 1975, with a truly all-star group including Bobby Hackett and Roy Eldridge (!). Of course, the King offered us AVALON, STOMPIN’ AT THE SAVOY, and DON’T BE THAT WAY to enthusiastic applause, but I was much more moved by Hackett’s choice of a feature number — an uptempo SECRET LOVE, which I can still dimly hear in my head as I write this. Does this make me a snob for asking my beloved jazz heroes to “be original”? I don’t know. Perhaps if I had been able to ask Benny why he explored and re-explored AVALON, he would have said, “I like it.” And that would have been enough, even for me. Any artist who’s given us so much for such a long time is entitled to his idiosyncracies.